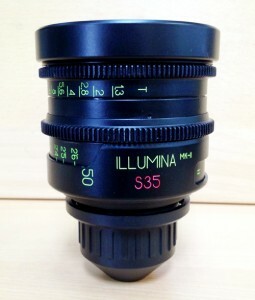 We put these Russian LOMO manufactured PL mount lenses through the paces and here are the results. For my tests I compared them to the now 30-year-old Zeiss Super-speeds and Zeiss Master Primes. It’s not exactly fair to compare these lenses to Master Primes, which cost four times as much, but it was a good way to measure how they stack up against the top of the line. The set comes with 18, 25, 35, 50 and 85 mm focal lengths, with 135mm on the way. Their metal bodies feel solid, the focus gears felt smoother than the Super-speeds, but not nearly as butter smooth as the Master Primes. All of the lenses are 95mm diameter, all of the focus gears are in the same place and they only track in and out by 1/4 in. (or less, depending on the focal length), reducing the work in switching out lenses on set and making it uncomplicated to interface with a mattebox. The image circle is big enough for the Epic 5K sensor and also short enough to fit in any camera we carry. They’re bigger and heavier than the Super speeds but still on the small side, the longest lens measuring at 135mm and the heaviest at 3.41 lbs (1.55 Kg). marginally so. 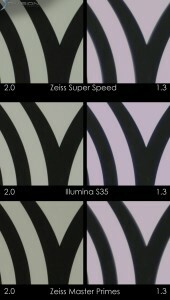 However the one thing that it excelled in vastly over the Super-Speeds was the image breathing. Super-Speeds breathe a lot, but the Illuminas breathe hardly at all and in fact were almost as good as the Master Primes in this regard. 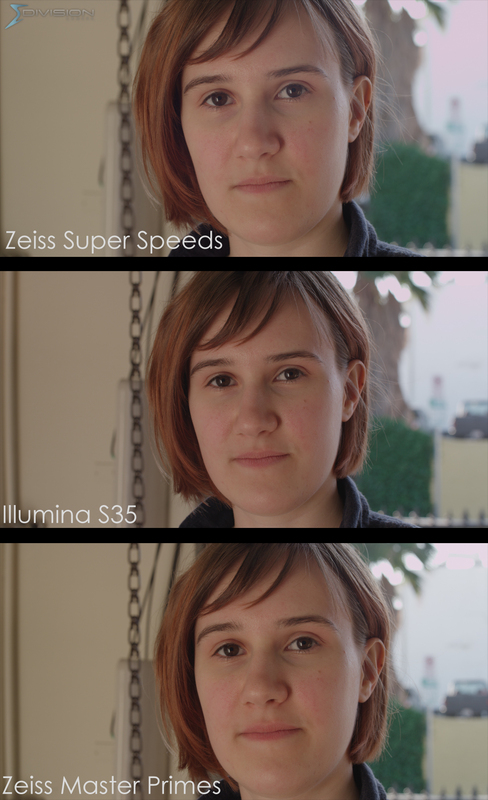 As I said the rest of the specs were a little better than the Super-Speeds but not as good as the Master Primes: The resolution, the vignetting, chromatic aberration, blooming, etc. Speaking of blooming. 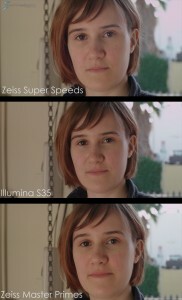 Everything looks great until you get it below f2.0, then it blooms, but this is no worse than the Super-Speeds, and even the Master primes bloom below f2.0 to a noticeable degree. 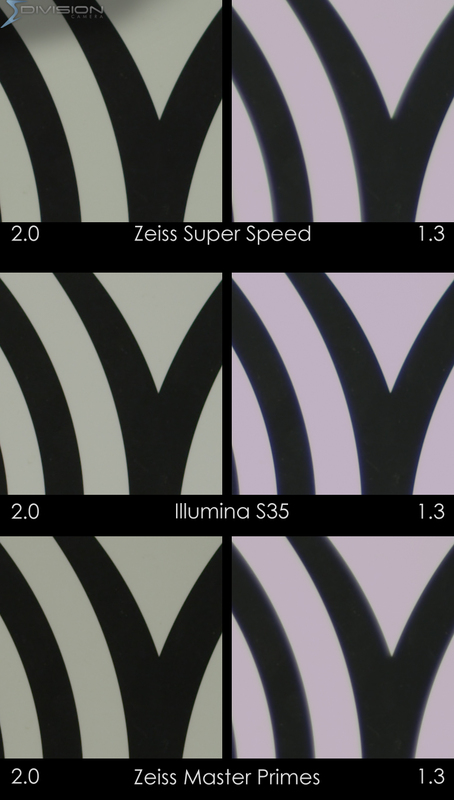 In fact, on the projector they all bloomed below 2.0, but on this focus chart, the Illuminas bloomed significantly less than even the Master primes, big plus. 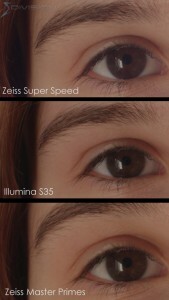 The detail resolution on the focus chart proved to be favorable, with the Illumina predictably landing between the Super Speeds and Master Primes. The difference was more evident on the projector test, something which is difficult to photograph for the blog. The field of view is slightly different between each lens set but nothing unusual. The color is slightly cooler than the Super-Speed or Master Prime. It was able to resolve more color information in the highlights you can see in the picture background but not as much as the Master Primes could. The only odd thing is the flare the lenses produce. The flare looks nice and pleasant but there is some kind of material that is reflecting off of the inside of the lens that shows up in the image as green flecks. 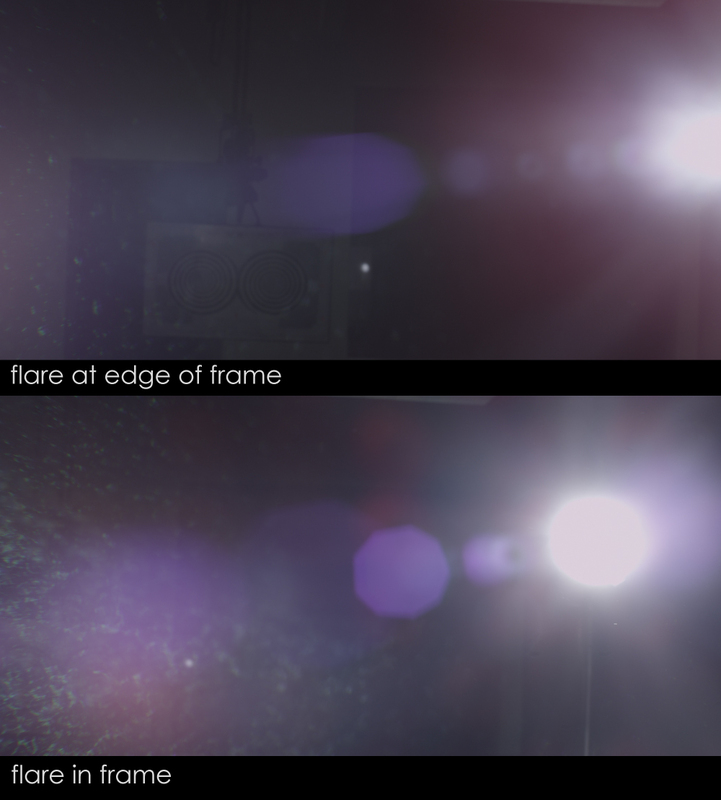 I actually think it’s an interesting look but if you need your flares to be more clean looking, this might not be the right lens for that job. With Super-Speeds increasing in age and scarcity, and the price of Ultra Primes out of reach for some, this lens set is an excellent alternative to fill the niche. Overall impression: the lenses deliver great cinema quality with a wide f/1.3 aperture and a lower price point compared to the more established Zeiss Ultra Primes. 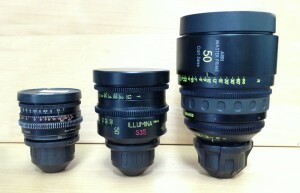 Visit Division Camera.com to see our stock of available lenses.